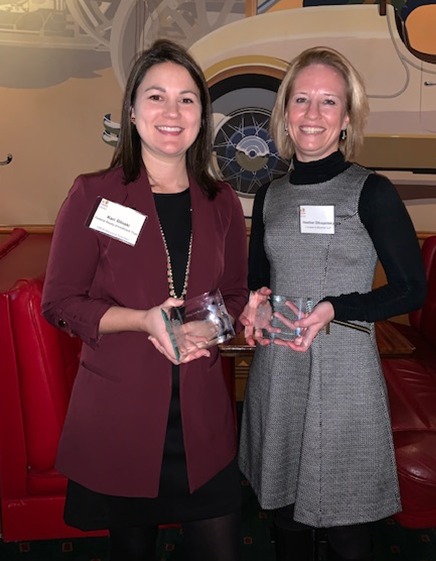 Heather Dlhopolsky, Partner and Chair of the Land Use/Zoning Practice Group (shown on right in photo), was honored recently by the CREW (Commercial Real Estate Women) Maryland Suburban chapter with the “Beyond the Stars” award. This award recognizes a person who has reached the top of their field and continues to find ways to contribute positively to CREW as well as their business and community. On the left is the recipient of the “Rising Star” award, Kari Glinksi from Federal Realty Investment Trust.